If you have a question about our Frankfurt store then please send us an email as often this is quicker than calling! Click here to see when our next delivery of new stock is! Information Page Last Updated 13.04.19 - This start page is updated regularly with important information on opening hours and product availability. * Please Note to ensure we have an item in stock it is always better to email us first as our products are directly imported from the UK, not all items may be in stock especially our chilled range of bacon, sausages etc. Just looking for tea? then visit our English Tea Shop, which offers a huge range of British Blend Teas, including the complete Twinings range, Brew Tea from Manchester, Teapigs, Williamson Tea, Darvilles of Windsor, Tetley Tea, PG Tips Tea, Typhoo Tea, The Edinburgh Tea & Coffee Company, Barrys Tea, Cornish Tea, Dorset Tea and many more. Pre-orders can also be collected free of charge in our Frankfurt Store. Welcome to A Taste of Britain, your British Shop in Frankfurt. Since 2004 we have been providing not only the local expat community with the essential food from home, but also a growing German customer base who appreciate many of the specialities which the UK has to offer. Further information about these great British foods can be found on the following pages and we look forward to welcoming you to our English shop in Frankfurt. If you wish to shop online please visit www.british-food-shop.de. 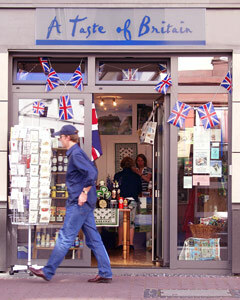 Willkommen bei A Taste of Britain, Ihrem British Shop in Frankfurt. Seit 2004 versorgen wir die Expats in Frankfurt und im Taunus mit den Lebensmitteln, die sie aus der Heimat vermissen. Aber auch immer mehr Deutsche kommen zu uns, um die Spezialitäten wiederzuentdecken, die sie auf Reisen kennengelernt haben. Auf den folgenden Seiten finden Sie mehr Informationen über uns und die Produkte, die wir führen. Wir würden uns freuen, Sie persönlich in unserem englischen Laden begrüßen zu können. Unseren Online Shop finden Sie unter www.british-food-shop.de.